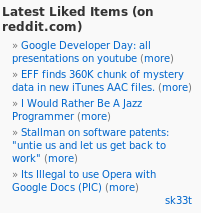 Number 8 in Widget-A-Day is a reddit widget. It’ll display your latest liked items on reddit.com. You can edit the display, count, and username. There are 3 parts needed to format the output. 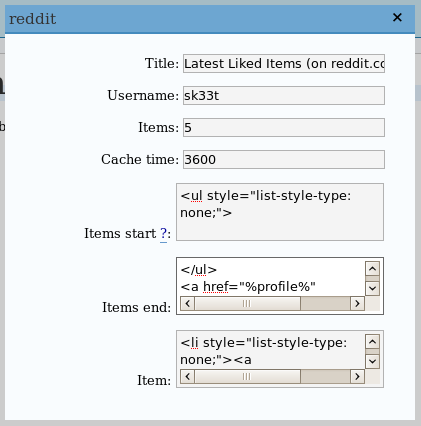 The first part, called items start in the admin panel, is the first part of the widget after the title. For the default formatting, this is just <ul>. This is very nice. Good work. I do have one problem though. For some reason it keeps cutting off the first letter on each of the posts. Not sure why.